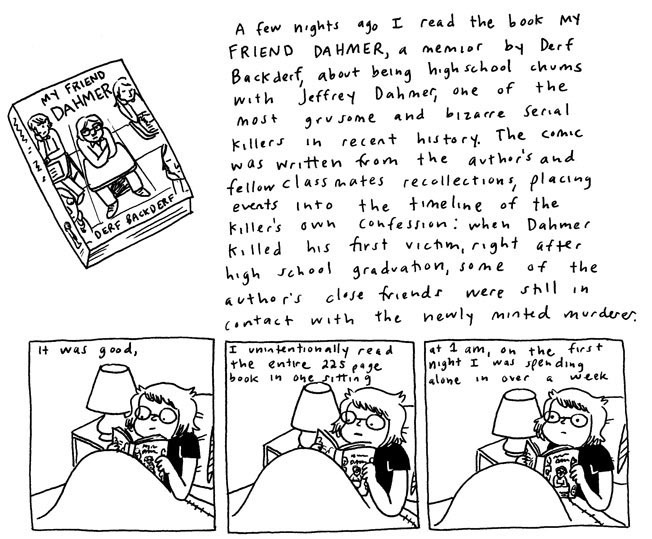 Indy comix creator Liz Prince has penned a comic about reading MFD for the first time. You can read the entire piece on her site HERE. I love these narratives. It reveals the "ripple effect" that occurs via interpersonal experiences/communications -- specifically graphic art. 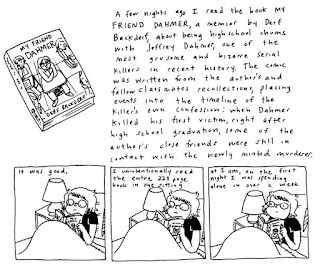 It's also fascinating to see the illustrations of a person, e.g., Liz Prince, who's possibly dealing w/ OCD, react to the young individual that was Dahmer, as revealed through Backderf's works. The fact that Prince's likely internal landscape is on the opposite end of the psychological spectrum from that of the late Dahmer, or those that express like him, makes for a great read/study.